Win $20,000 On June 5 and $70,000 During The Summer With Our PokerNews Freerolls! If you like playing for free money, and we know you do, you are really going to love playing at PokerStars, as we are going to give you a shot at $70,000 in freerolls! Do we have your attention? Good. Very good. Here's how you can fill your pockets full of cash with no risk to you. This is not the kind of offer you are going to find every day! Win a Share of $20,000 on June 5! Even if summer hasn't officially started yet, it is already time to get excited, as the first freeroll tournament is right around the corner. Get your fingers flexed and your mouse ready to play for some big bucks for free in the upcoming PokerNews $20,000 Freeroll starting at at 19:00 GMT on June 5. Attention: time is running out to qualify for this tournament, but if you hurry there is still time to get in on the action. There are two separate paths to qualify for this tournament, depending on whether you already have a PokerStars account or not. If you already have opened a PokerStars account through PokerNews, the path is quite simple. Just generate 100 VPPs during the month of May and you will automatically be eligible to compete for a share of $10,000. Frankly speaking, 100 VPPs isn't a lot, and it's definitely something you should be able to generate even if you haven't played at PokerStars at all yet this month. If you do not have an account at PokerStars yet, you are in luck. 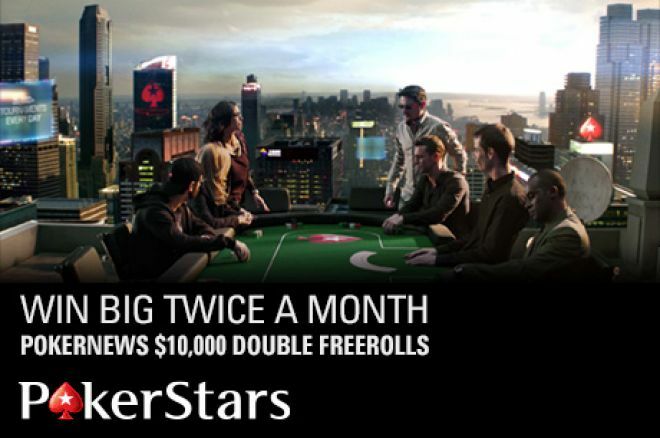 All you need to do in order to qualify is to download PokerStars through PokerNews Canada, open an account using the unique marketing code "POKERNEWS.COM" before May 31, and make your first deposit using the bonus code "STARS600". Following these easy steps will not only allow you to be eligible for many PokerNews-exclusive promotions (including June's great $20,000 freeroll) but also entitle you to a 100% deposit bonus up to $600. If you have already met these requirements during the month of May, just go ahead and register for the tournament by either searching the private tab in the tournament lobby for the PokerNews $20k Freeroll, or via the tournament ID 909796230. So mark you calendars and don't forget to play in the PokerNews $20,000 Freeroll on June 5. Head to the $20,000 PokerNews Freeroll landing page for all the terms and conditions of this promotion. Win a Share of $50,000 in July and August! We promised you $70,000 in freerolls, and we aren't going to let you down. Due to the special relationship that PokerStars and PokerNews enjoy, we are able to give away another $50,000 in five amazing freerolls during July and August to our players! The first two $10,000 freerolls are scheduled on July 9 at 19:00 GMT for PokerNews players that qualify during the month of June. The remaining three $10,000 freerolls will take place in the beginning of August will be available for anyone that qualifies in July. Similar to the June freeroll, there are two paths to get involved in the July freeroll depending on whether you are a new or existing player. If you have already opened a PokerStars account through PokerNews, just generate 100 VPPs in June to qualify for one freeroll, or 150 VPPs to qualify for both $10,000 tournaments. You have an entire month to accumulate these VPPs, and this makes it ridiculously easy to do, regardless of the stakes you play. The VPP requirement is dropped if do not already have a PokerStars account. If this describes you, your path is, again, a little easier. Just create a PokerStars account through PokerNews Canada using our marketing code POKERNEWS.COM, and make a deposit between June 1 - 30 and you will automatically be eligible to enter these great-value tournaments using the details listed below. The paths for the three freerolls in August are similar to July, but with a twist. They are exactly the same if you do not already have a PokerStars account. However, if you are already a loyal PokerNews player on PokerStars, you need to generate 100 VPPs in July to be eligible for one freeroll, 150 VPPs to be eligible for two freerolls, and 200 VPPs to be eligible for all three freerolls where $30,000 combined will be on the line. So, yes - it is really that easy for you to have a chance a big money and play for a share of $70,000 this summer! Are you going to be with us? Reminder: We Are Giving Away 100 Tickets to PokerStars 1m Gtd. Sunday Storm – For Free! Qualify to PokerStars 3rd Anniversary Sunday Storm to Win a Share of Over $1 Million! 20,000 Great Reasons to Play at PokerStars in April!